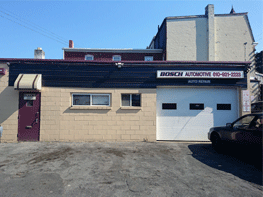 Bosch Automotive LLC Offers Auto Repair Services You Can Count On! 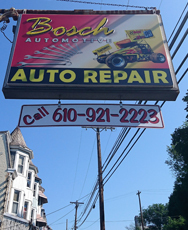 Bosch Automotive LLC has been providing customers in the Reading, PA 19605 area with high-quality automotive maintenance and repair services since 2007. Our experienced mechanics will get your vehicle up and running again, and we'll keep it in top operating condition. We provide a range of services, including 4x4 Services, Alignment, Brakes, Car & Truck Care, Domestic Cars & Trucks, Electrical Services, Electronic Services, Engine & Transmission, Engine Maintenance, General Services, Heating and Cooling Services, Import Cars & Trucks, Inspections and Emissions, Miscellaneous Services, Quick Lube Services, Tires, Towing and Undercar Services. We're proud of our great mechanics, who have years of experience working on many different types of vehicles. They have the knowledge required to diagnose your problems, and to find affordable solutions to get you back on the road quickly. To learn more about our services, call us at 610-921-2223 or email us today. We're looking forward to earning your trust as a friendly, honest and reliable alternative for your auto maintenance and repair needs in Reading. Courteous, Efficient, Fast, Friendly, Professional Owners and employees and extremely reasonable prices on work performed and necessary, NOT high pressured at all, YOU decide what work is to be performed with guidance and information provided by technicians who work here. EXCELLENT All around !!! LOVE THESE GUYS/Gals.!!! May they ALL live Long & Prosper. HOORAH, SEMPER FI !!! Fast, honest, great service from a reliable mechanic. Always go to them for all my garage needs. Consist great service and a staff that does what they can to help you out. One of the few garages that prices fair for their service. If you refer a new customer, you will get $10.00 off your next service. Service Special! Get ready for the Winter Weather! Coupon not valid with other offers. Must present at time of purchase. One coupon per person. Does not apply to past purchases. Void where prohibited. Some restrictions may apply. Not valid with any other offer.